Beautiful, detailed shelf brackets. Sold in different designs. 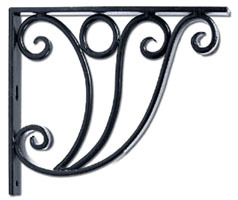 Made of solid wrought iron, these brackets make a welcome addition to any home. A superbly crafted and detailed, classic example of old-world blacksmithy.